Jupiter Bach is proud to announce that we will be attending the DSE Messe 2019 at DTU again this year. As part of our core values, We Deliver – We Innovate – We Care, we strive to connect and innovate with local talent from universities in the area. We hope to see you at our stand in the Beta tent (Stand 443), where you can find out more regarding recent innovation developments and discuss collaboration opportunities with us. Quality, Health & Safety and Environment are essential to us and prerequisite for the way we do business. To strengthen our QHSE management even further processes throughout the company has been optimized and standardized. We are proud that all site specific standalone certificates now have been transferred to one global multi-site certificate on respectively Quality, Health & Safety and Environment. We are proud to announce that Jupiter Bach is adopting to the APQP4Wind process by getting two of our colleagues certified as APQP4Wind Specialist. APQP4Wind has since January 2017 been the frame of reference to be used in the wind industry in order to strengthen the cooperation between manufacturers and suppliers, speaking the same language, ensure quality assurance processes and thereby contribute to lower the cost of energy. For Jupiter Bach this is the starting point for implementation of an APQP4Wind process where quality should flow throughout the entire management team and organization. All the key functions will be actively involved in driving risk identification and mitigation. APQP4Wind, as part of project management, will support on-time, cost, quality, delivery and ensure satisfied customers. But above all, it will help our organization in a changeover process to a more proactive and preventive mindset. Beatriz Quintanilla Fernandez in her role of Global Quality Manager and Marta Ordas Tejedor in her role as Global Administrator will lead the change together with a cross functional team. Through our devotion to wind, Jupiter Bach is in the progress of expanding our production footprint in China, by a new state of the art factory in Dezhou, Shandong province, to serve leading wind turbine manufacturers. 2019 has started at a high pace for our team in Dezhou (Shangdong, China) as we are well on the way to start operation in a newly built factory complex during second quarter of 2019. The new factory will be nearly 25,000 m2 and will further strengthen the global leadership of Jupiter Bach, delivering high quality and competitive components for the wind industry and thereby supporting the strategy in the industry to further improve levelized cost of energy. Starting at the design phase, the new factory has been laid out to fulfil the highest environmental standards and supported by investments in production technology, high quality and efficiency are key factors of the new factory. The location in Dezhou is strategically chosen to serve both global and local customers in the wind industry and each year more than 50,000 parts will leave the location and be part of wind turbines producing green energy for a cleaner world. 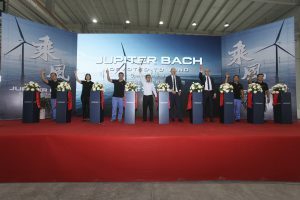 Together with the newly inaugurated factory in Weihai (Shandong, China) Jupiter Bach operates more than 35,000 m2 in China. During December 2018 Jupiter Bach has rolled off the line nacelle cover number 50,000 since Jupiter Bach entered the wind power industry. Nacelle cover #50,000 is a Shanghai Electric 7MW offshore cover built in our newly inaugurated factory in Weihai, China. The 50,000 covers are mounted on approx. 15-20% of the total installed turbines, which produce enough renewable power for over 75 million homes. Jupiter Bach is very proud to be part of this positive impact on the reduction of the global carbon footprint and is very much looking forward to continue partnering with our customers working towards the same goal. Safety, quality, delivery and cost are key when launching new products in today’s market. The SQE (Sourcing Quality Engineer) team from Vestas has been visiting the Jupiter Bach factory in Dezhou, China to carry out First Article Inspection of the first 3MW nacelle cover panels which will be delivered to Vestas Brighton Nacelle factory in the USA. Vestas plans to assemble the first 3MW Nacelles at the end of 2018 which will be installed as part of new wind projects for the US wind market and mark a shift in the demand size of turbines in the US. The First Article Inspection includes inspection of moulds, assembly fixtures, fiber panels, mounting parts, pre-assembled nacelle parts and transport fixtures. In addition, work instructions, process descriptions and procedures are verified to secure safety, quality, delivery and cost. The experience Jupiter Bach has in the wind industry really shows during these qualifications as the company has substantial experience with what the customer requires and lives by the values the customers also strive to. The SQE team was very satisfied with the overall inspection of the tools, products and documentation and Jupiter Bach now has received the green light from Vestas to begin shipping units to the USA. Read more about our Certified Quality. High quality, efficient supply chain and timely project execution are paramount in today’s wind market. One of Jupiter Bach’s existing customers has selected Jupiter Bach to deliver the nacelle cover and spinner to a new version of a 3 MW platform, which the customer has introduced to the market last year to secure the continuous improvement of Levelized Cost of Energy (LCoE). The project started a couple of years ago with the delivery of prototypes followed by ramp-up during 2018. The production is now running full speed in the newly expanded Jupiter Bach production in Poland located in the proximity to Stettin. The project teams from the Customer and Jupiter Bach have been meeting frequently at the Jupiter Bach factory in Poland to align quality requirements and develop a new packaging and transport concepts to secure an effective transport from Stettin to the customers Nacelle assembly factory in Europe. In total Jupiter Bach has 6 factories globally with 75.000m² of manufacturing and assembly capacity spanning the globe from Asia to Americas.